Inaugural Annual Frank McCluskey Friendship Outing! Canoe trips in the summer are nearly always a favorite for Scouts, as they often spend as much time in the water as in the canoe! Add to this joyous scenario the opportunity to invite a best friend and you have the potential for uncontrollable fun — something bordering on unbridled chaos! This year’s annual canoe trip down the Upper Delaware River had an even more special aura about it, as the event was christened “The Annual Frank McCluskey Friendship Outing” after the unexpected passing of one of our dearest friends two months prior. All members of the troop agreed that there was perhaps no better way to continue to honor one of our own members that lived his life so strongly after the Scout Law & Oath than to name the troop’s favorite camping event after him. Though the troop made plans for two of its adult leaders to arrive early to check in with our canoe outfitters, there were some unexpected delays in getting our large group on the water. Suffice it to say that the logistics of managing a group of over 50 paddlers is much more complicated than a group of 35! With rain threatening the afternoon, our large flotilla of fun-seekers took about an hour to check in at the half way point for lunch–encroaching on the cutoff time for relaunching down the river. With limited time left in the afternoon, a decision was made that only the most ambitious (not necessarily “experienced”) oarsmen would paddle the rest of the distance. The other two-thirds of our troop took the bus back to relax and play in the river at our canoeing destination, TMR Landing. The late afternoon paddlers were given an extremely memorable treat and rowed through a 20 minute torrential downpour, followed by numerous Turkey Vulture citings along with a few Golden Eagles. Scouts and their many guests continued the merriment into the evening hours as the campfire played host to the Annual Troop 353 Spoof Awards. Special spoof awards were given by the Sr. Patrol Leader and the Scoutmaster for such things as the “most absent scout”, “most likely to start a forest fire”, “most likely to tear down a live tree with his bear hands”, “most emails” along with merit badges for “Brain Surgery”, “Emergency Unpreparedness”, “Bungee Jumping”, “Tick Removal”, “Coffee Drinking” and the ever-popular “Snoring”. 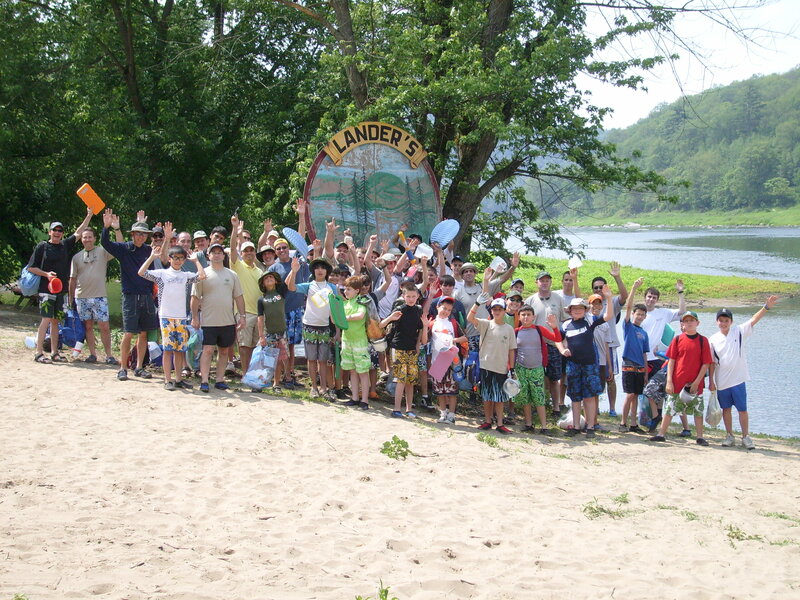 The Scoutmaster also gave a tongue-in-cheek “Top 10 Reasons People Want to Join Troop 353”, with the #1 reason cited as “the troop has an awesome canoe trip every year!” Indeed, the inaugural Annual Frank McCluskey Friendship Outing was a huge success and Frank would be proud! Fun photos of all the festivities can be found here! Author scoutmasterPosted on July 30, 2008 April 22, 2009 Categories Acquatics, Activities, Camping, Events, Photos, Ten Mile RiverLeave a comment on Inaugural Annual Frank McCluskey Friendship Outing!